What's Next? : Days 1 & 2: What's up? Days 1 & 2: What's up? Monday was a holiday here: Purim. Many religious jews dress up on that occasion. Prize for most original costume: Jesus. Yesterday, I had a chance to walk in the old city: Jaffa Gate, Armenian quarter, Western Wall, Holy Sepulchre, Muslim quarter, Cardo. 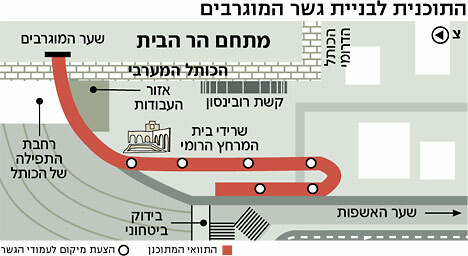 I was shocked because the Western Wall looks more and more like a mall: a parking lot like that of a supermarket, a security gate for the cars like a toll gate, a new construction in fake stones right near the wall, cranes in the back preparing for new buildings some 200 meters from the wall. Also, the temporary wooden bridge leading to the Mugrabi Gate of the Temple Mount is the ugliest thing you can imagine. In my humble opinion there is no need for access through that gate, i.e. from the West, and the planned final bridge (seen in red on the drawing below), if built in the same way as the rest here, will be very ugly too. The Archeological Park nearby looks nice, what I could see of the Mosque of Omar is amazingly beautiful, with its golden dome and turquoise walls. I enjoyed the walk in the Muslim quarter, seeing again the Church of the Holy Sepulchre, etc.